Vintage Santa . . . headin’ into the Christmas Season! I know . . . we just finished Halloween, and Thanksgiving is yet to come . . .but really, my heart is “deep” in Christmas thoughts. Biggest reason is that I have to get my list and check it twice, as I never leave shopping ’til the last minute! 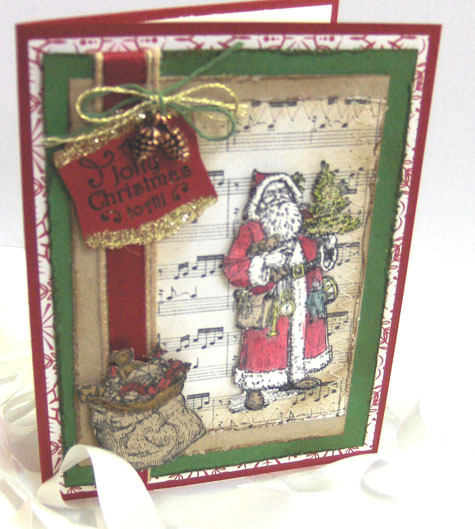 But – card making and holiday boutiques have also been on the agenda, so I’m going to start sharing Christmas cards. Our annual “Girlfriends Weekend” in Oregon was in October . . . and as always, did NOT disappoint! What was really interesting this year, was that many of us did Christmas cards for our projects . . .that hardly ever happens! One of my MOST favorites was Gail’s card . . . seen here . .. love the vintage, love the Santa, love her “stitching” touches . . . love it ALL! I’m actually thinking about trying to convert this card to a 5″ x 7″ card and use it next year for my Christmas cards! Meanwhile . . . enjoy!! Ho Ho Ho! !